Does Thyroid Disease Cause Hair Loss? Home » Cancer » Does Thyroid Disease Cause Hair Loss? For many people, their hair is a big part of their identities. Just ask my aunt Dianne; she has always been notorious for her long blonde locks. However, recently she noticed that her hair wasn’t as thick as it used to be. That being said, hair loss is considered a normal part of the aging process. The average person has 100,000 to 150,000 hairs on their head. Most of us lose 50 to 100 hairs each day, and the growth rate is about a half inch per month. The rate of hair growth is believed to slow down around the age of 40, and new hairs are not replaced as quickly. Several nutritional and hormonal factors are also thought to influence the speed of hair growth. Although hair loss is not a life-threatening condition, it certainly shouldn’t be ignored. Like most diseases, there are several root causes of hair loss. For instance, hair loss has long been considered a common side effect of thyroid disease, which can be as harmless as an enlarged gland, or as life-threatening as thyroid cancer. A 2011 retrospective study published in the journal Dermato-Endocrinology found an association between hair loss and thyroid abnormalities. Other studies suggest that thyroid disease can cause hair loss. The thyroid is a small butterfly-shaped gland that produces hormones that influence every metabolic process in the body. Hypothyroidism and hyperthyroidism are the most common types of thyroid disease. Hashimoto’s disease is the most frequent cause of hypothyroidism, and Grave’s disease is considered the top cause of hyperthyroidism. Since hair growth depends on the proper function of the thyroid gland, abnormal thyroid hormone levels will lead to hair loss if the thyroid disease is not treated. Other hormones will also impact thyroid diseases. Higher levels of the hormone estrogen can negatively impact thyroid function in women with hypothyroidism. Elevated levels of the stress hormone cortisol will suppress thyroid function. Lower levels of a stress hormone called dehydroepiandrosterone (DHEA) is also thought to lead to hypothyroidism. Various reasons can also cause hypothyroidism, including lithium medication, radiation cancer treatment, iodine deficiency, thyroiditis (thyroid inflammation), and surgery to remove the whole or part of the thyroid gland. People may experience hair loss as a result. The main conventional treatment for hypothyroidism is the synthetic thyroid hormone called levothyroxine—also known as T4. 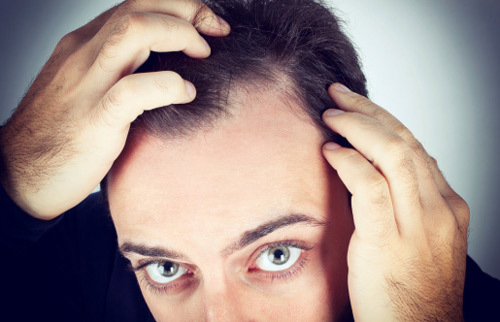 It is ironic that hair loss is among the side effects associated with levothyroxine. Other side effects linked with levothyroxine include diarrhea, vomiting, appetite, weight changes, insomnia, sweating, fever, hot flashes, and an irregular or fast heart rate. In some cases, other antithyroid treatments, such as propylthiouracil and carbimazole, can promote hair loss. It may be difficult to assess whether the impaired thyroid activity or antithyroid drugs caused the hair loss. Another possibility is that a patient’s thyroid medication is not effective and the thyroid problem is what is causing the hair loss. When hair grows back, it is a sign of a successful thyroid disease treatment. Normal hormone levels will be a clear indication of healthy hair growth. In a thyroid panel blood test, the normal range for thyroid-stimulating hormone (TSH) levels will be between 0.35 and 5.00 milli-international units per milliliter (mlU/L), normal free T4 is 9 to 23 picomole units per liter (pmol/L), and normal free T3 is 3.5 to 6.5 pmol/L. How to Treat Thyroid Disease and Hair Loss? As mentioned, there are several side effects associated with conventional thyroid treatments, which can also lead to hair loss. Luckily, there are natural treatments for hair loss and thyroid disease. Here are some important remedies that help treat both conditions. Vitamin B complex: Several B vitamins encourage hair growth and thyroid health. For instance, biotin (vitamin B7) promotes hair growth and scalp growth. Vitamin B6 and B12 are also important for normal thyroid hormone production and hair growth. Vitamin B12 is also thought to be at the root of hair loss. Nutrients: It is quite important to address hypothyroidism, especially when hair loss is an issue. It is a good idea to include several other nutrients for thyroid support such as iodine, zinc, L-tyrosine, selenium, vitamin A, vitamin C, vitamin D3, and vitamin E.
There are also other ways to treat hair loss and thyroid disease. Other natural remedies for hair loss include saw palmetto, polygonum multiflorum, silicon, methylsulfonylmethane (MSM), rosemary essential oil, a natural progesterone cream, and a greens formula. Other natural remedies for thyroid disease include bladderwrack, guggul, ashwagandha, DHEA supplements, and a thyroid and pituitary glandular. Balch, J., et al., Prescription for Natural Cures: A Self-Care Guide for Treating Health Problems with Natural Remedies Including Diet, Nutrition, Supplements, and Other Holistic Methods (Hoboken: John Wiley & Sons, Inc., 2004), 295-299, 340-345. Lo Sicco, K., et al., “A retrospective study of thyroid structural abnormalities in alopecia patients,” Dermato-Endocrinology, 2011; 3(4): 251-254, doi: 10.4161/derm.3.4.16838. “Understanding Thyroid Problems – the Basics,” WebMD web site; http://www.webmd.com/women/guide/understanding-thyroid-problems-basics, last accessed October 28, 2015. Vincent, M., et al., “A Descriptive Study of Alopecia Patterns and their Relation to Thyroid Dysfunction,” International Journal of Trichology, 2013; 5(1): 57-60, doi: 10.4103/0974-7753.114701. “Levothyroxine,” Drugs.com, http://www.drugs.com/levothyroxine.html, last accessed October 28, 2015. Shomon, M., “Hair Loss Solutions for Thyroid Patients,” About Health web site, last updated Oct. 23, 2015; http://thyroid.about.com/cs/hairloss/a/hairloss_2.htm, last accessed October 28, 2015. “Hair Loss and Thyroid Disorders,” British Thyroid Foundation web site; http://www.btf-thyroid.org/information/109-hair-loss-and-thyroid-disorders, last accessed October 28, 2015. Rodriguez, D., “Is Thyroid Disease Causing Your Hair Loss?” Everyday Health web site; http://www.everydayhealth.com/skin-and-beauty/thyroid-disease-and-hair-loss.aspx, last accessed October 28, 2015.